Chapter 1. General principles of Echocardiography in the operating room. Chapter 8. Congenital heart disease. 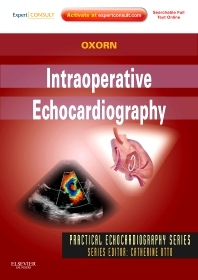 Intraoperative Echocardiography - a volume in the exciting new Practical Echocardiography Series edited by Dr. Catherine M. Otto - provides practical, how-to guidance on intraoperative echocardiography in adult and pediatric patients. Definitive, expert instruction from Dr. Donald C. Oxorn is presented in a highly visual, case-based approach that facilitates understanding and equips you to master this difficult technique while overcoming the unique challenges and risks it presents. Access the full text online at www.expertconsult.com along with cases, procedural videos and abundant, detailed figures and tables that show you how to proceed, step by step, and get the best results. Master challenging and advanced intraoperative echocardiography techniques such as epiaortic echocardiography and 3-D echocardiography through a practical, step-by-step format that provides a practical approach to image acquisition and analysis, technical details, pitfalls, and case examples. Reference the information you need quickly thanks to easy-to-follow, templated chapters, with an abundance of figures and tables that facilitate visual learning. Become an expert in echocardiographic evaluation of complex valvular heart disease, congenital heart disease, and intravascular devices in patients undergoing cardiac surgery and interventional cardiology procedures. Access the complete text and illustrations online at www.expertconsult.com plus video clips, additional cases, and much more!